>Jalan Alor Night Market, a convenient destination that's sure to satisfy your foodie cravings. >Experience Changkat Bukit Bintang Nightlife Scenes. - i)Where should I meet? - Meet at the entrance of Berjaya Times Square Mall. - ii)What time shall I be there? - For all travellers, please arrive 20 minutes prior to the scheduled departure time for your tour. - iii) Who can participate? We start off our tour at a convenient meeting point in the heart of Kuala Lumpur. Our first stop at the Royal Selangor Pewter will feature the largest and most modern pewter outlet in the world, reputed internationally for its high quality and craftsmanship. . Next we stop at Batik Factory – see how Batik is designed and printed. 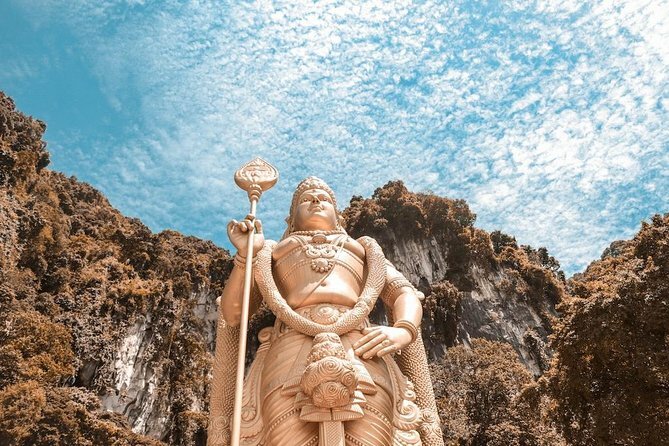 Then we proceed the limestone hills of Batu Caves that comprises of three caverns and several smaller caves. It is the shrine of Lord Murugah, a Hindu deity – a flight of 272 steps lead up to the temple cave. Another cave, called the museum cave, is filled with images of deities and murals depicting scenes from the Hindu scriptures. As the sun begins to set, we begin our Kl Nightlife adventure atJalan Alor ,a destination that's sure to satisfy your foodie cravings . Hosting a lot of hawker stalls and seafood restaurants, Jalan Alor is one of the most famous roads in Kuala Lumpur for food. Finally, we visit Changkat Bukit Bintang , an avenue on which a large number of KL’s most popular bars and restaurants can be found, it is a trendy place that is great for a glass of beer.The whole street comes alive with lights, colours, and people having a great time.